Kenyan health services are often unable to serve the Deaf adequately due to the language barrier. Continuing on the success of a similar project in 2007, a health-focused poster will be created and distributed to hospitals, clinics and voluntary testing and counseling sites nation-wide. The poster will highlight more than 50 health-related signs, the alphabet, numbers and information on how to contact a local interpreter. Production will include working with Deaf organizations and health-focused NGOs, sign language and health issue research, training of the Deaf, surveying selected sites on Deaf issues and Deaf awareness education. The collection of publication of health-related signs and production skills will add to a growing amount of research on Deaf issues in Kenya that future projects and other aid organizations can utilize. Kenya suffers from a lack of adequate health education materials for the Deaf. While there are many materials designed for the hearing in English, Kiswahili and other spoken languages, materials using sign language have not been created at a scale necessary to serve Kenya's roughly 300,000 Deaf. Many people mistakenly assume that English or Kiswahili materials can also serve the Deaf community. This is an inadequate solution. Kenyan Sign Language (KSL) is the "native tongue" of Deaf Kenyans. Other languages are acquired slowly and often poorly in Kenya's few schools for the Deaf. As any Health professional knows, matters of life and death are best discussed in the native tongue to avoid miscommunication. Similarly, effective communication of reproductive health messages is essential for addressing serious health threats like HIV/AIDS. Though the Kenyan government and aid organizations have begun to better serve the Deaf, most of Kenya's Deaf have not received proper reproductive health education and are generally unfamiliar or uncomfortable with a health system designed for the hearing. At the same time, there is wide-spread misunderstanding among the hearing about the Deaf, who are often thought to have lower intelligence. These conditions have created dangerous situations when the Deaf seek medical attention. During our service in Kenya we met many Deaf people who explained their difficulty seeking medical help. Basic information about what is ailing the person, how to take medication and what the results of a test mean often elude a Deaf Kenyan because of the language barrier. It is this language barrier that must be confronted to better-serve the Deaf. Language development is crucial to a child’s learning and social skill development. Deaf children in Kenya are at a particular disadvantage as few parents of the Deaf know Kenyan sign language or have the means to obtain sign language skills. As a result, many Deaf students in Kenya develop language skills later in life thus slowing their learning acquisition and limiting accessibility of vital information that they might pick up in the home. We addressed this problem in 2007. During our time as Peace Corps volunteers in Kenya, we partnered with multiple schools and organizations to create the "Easy to Learn Kenyan Sign Language" poster. Our goal was to address the lack of KSL being used in Deaf students' homes. In addition to the alphabet and numbers, we identified 51 signs in five categories: questions, family, food, work and health. We worked with local Deaf communities to come to a consensus on exactly which signs would be used and how they would be performed. Knowing Kenyan culture's love of posters and the fact that posters would be treated better and last longer than any form of low-cost printed material, we settled on A2 size prints with a metal hook for easy placement on a wall. Each sign illustration was accompanied by the English translation, a Kiswahili translation and an icon to serve the illiterate. For the first printing, we distributed almost 2,000 posters to the parents of Deaf children at five schools. We collected extensive data on what signs were being used in the home, what other language were being used in the home, what issues were encountered when parents tried to communicate with the Deaf children and more. We discovered that Kiswahili and English were the appropriate languages to use since they are the dominate spoken languages of Kenya. We also found ways to improve our illustrations, clarify the icons and improve readability. Overall, the first printing received an overwhelmingly positive response. All volunteers who participated in its distribution were flooded with requests for more. With the lessons learned from an initial test printing, we then printed 5,000 copies; this was enough for every child attending a school for the Deaf with a Peace Corps volunteer, staff members of every Deaf school and a small number for communities surrounding Deaf schools. Creation of a digital library of KSL signs. This library could be built in a way that makes it very easy to add and modify signs. Applications could be built to pull from the library for different uses: digital quizzes, printed materials, a phone application and so on. Creating posters in other sign languages. 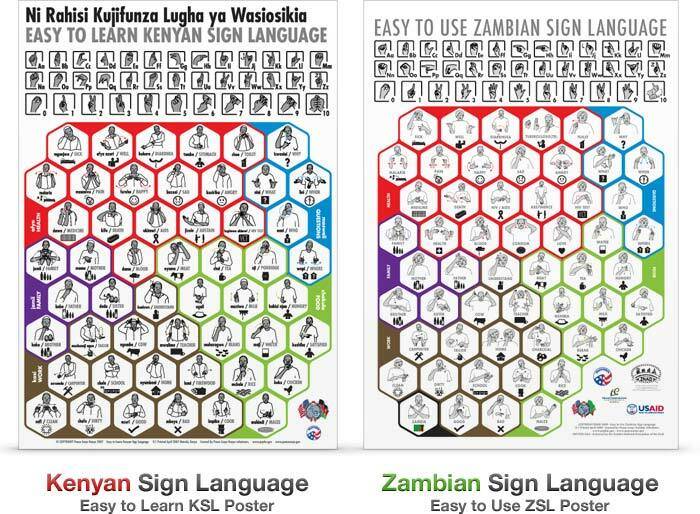 For example, a adaptation of the original KSL poster has been made for Zambian Sign Language by Frank Lester and Mindful Interactive. Be an implementer. We are always looking for organizations to partner with that would be willing to distribute the KSL poster. Example implementers include: schools, HIV/AIDS testing clinics, resource centers, libraries, goverment offices, just to name a few. Fund development. Please consider funding to help us continue development of Sign Language Posters and its future directions.